Oviedo Woman's Club has chosen Alpine Academy as a receipient of their philanthropic award for the 2nd year. 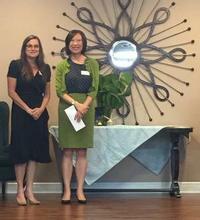 Jing Zhou and Dr. Kelly Schaffer accepted the award at the award ceremony. Representative John Mica was very kind to send us a letter to congratulate Alpine. Alpine Academy was featured in Seminole County Business Spotlight. Alpine Academy was excited to have the opportunity to share our story and to introduce our program to the Seminole County commissioners. To see the video, click here. Team Alpine Academy and Interventions Unlimited raised over $4000 for Autism Speaks. "Jing, your love, expertise and dedication are the perfect ingredients to enable all the affected children a worthy quality of life: a dignified and participatory role in our community. Thank you!"